This blog is sponsored by Almond Breeze. The content and opinions expressed here are that of my own. The familiar ache in my feet puts a smile on my soul as I hop from creek boulder to sandy banks deep into the Needles district of Canyonlands National Park. The 16 mile loop being my longest run in months, there are no objectives for this outing other than to cover lots of beautiful terrain now that sun finally has the strength to dry up the muddy mess winter made of the desert. I rejoice running in shorts! A super alpine start of 3 pm made it possible to take the final miles in as the canyon walls are painted orange in the dusk light, their magnificent towers reflected in the sandstone tinajas I stop to drink from when I get thirsty. Darkness settles in, and yet I can still make out the gleaming pools and distant ridge lines in the shades of black. I walk the final mile to let it sink in. When I’m feeling replenished I head back home, to a remote mesa, to light a fire, eat dinner and camp. I’ve spent the bulk of this winter continuing to live in my jeep out in the canyon country of southern Utah. With the completion of my next two books (Outlandishand The Best Grand Staircase Escalante National Monument Hikes), I needed time in the wilderness to center myself. Back in Bears Ears especially, I enjoyed the still splendor of winter, devoured books by the campfire, explored the landscape blanketed in snow, and contemplated my next endeavors for writing, running, and adventure. The day after my Canyonlands run I returned to cell service and received an email inviting me to run the Boston Marathon in partnership with Almond Breeze. I’ll admit this was a tough decision –the first honestly being a reluctance to leave the desert. My list of canyons, mesas, and historic routes I want to explore grows daily. Even a weekend away pulls me from objectives that are admittedly impossible to complete in this lifetime. As a former competitive track and road racer I’ve also always qualified for the race opportunities I’ve participated in. In previous marathons I’ve qualified for Boston 4 times but never entered the race. Since switching to trail and mountain running, road races have slipped far from my agenda. Now, after a winter of crawling and stopping slowly through canyons buried in snow, I feel ready to take on numerous adventures, but racing a marathon? But therein lies the opportunity for challenge and adventure–which I relish! With less than 4 weeks to prepare, I set myself up to experience running a marathon the way most folks do–on a wing and a prayer that mixing some running into a life focused on life, not running a marathon, could get me to the finish line. I’ve trained Disaster Style before, and I certainly know I can do this–it just requires a bit of suffering. In between my “big training days” I go for jogs/walks, write stories, and stretch out. Simple. While I feel far from the fitness and speed I once had, I’ve noticed a far more remarkable shift–pure joy! No longer compelled or coached to do x, y, z because it is on the schedule, I can listen to my body while also utilizing it creatively to combine my passions. As a result I am using my vehicle (legs and feet) to take me through some of the most beautiful landscapes. Boston will be a wild adventure, trotting down the concrete jungle with a massive herd of humans. It’s an extreme contrast to my solo meanderings in the desert amongst deer, lizards, snakes and toads. But the spirit of exploration is to branch out from what we know into new territory. I can fully attest that if Almond Breeze had not contacted me, I would not be flying to Boston tomorrow to run a road marathon–my version of terra incognita. 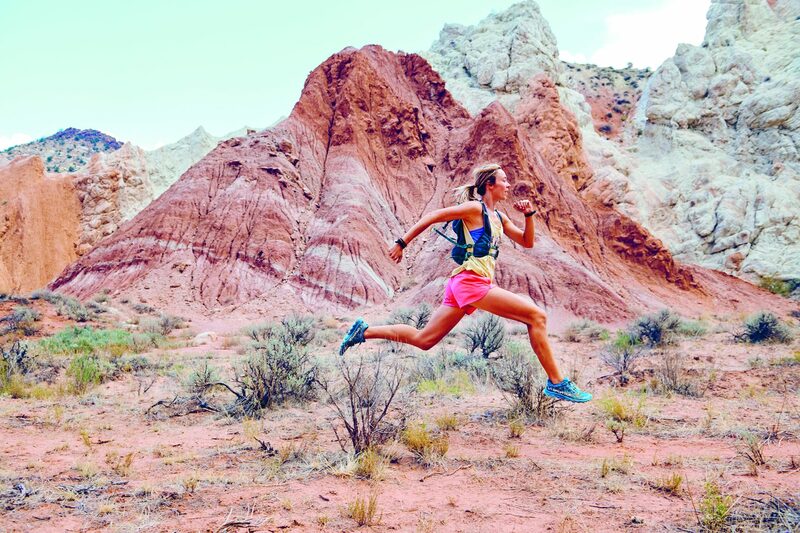 However, I am incredibly grateful for Almond Breeze’s support—both in terms of providing me with nutritious fuel for my training and adventures, and for the opportunity to expand my adventures. My only goal is to fully soak the experience in with every step I take, and no doubt carrying a few grains of sandy desert memories with me.